If you’ve experienced an injury * at work you may have certain questions in mind regarding your employer’s responsibilities and how to go about instigating an accident at work compensation claim *. On this page you will find some highlighted extracts from our guide to the compensation claims * process. If you have any questions about injuries you’ve suffered in the work environment, our live chat operator is available to help you with any queries you may have at any time or, you can just give us a call on our nationwide Freephone number 1800 390 555 during office hours. Our Accident at Work compensation claims * solicitors are based at our offices in Dublin and Cork, however we assist people across the country from Limerick to Galway. 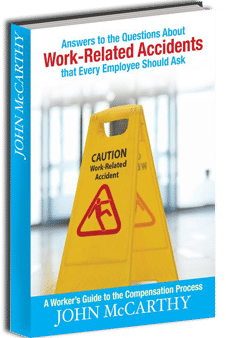 To get your free copy of The Work Related Accidents Guide just leave your details below.